The area comprises the ancient ecclesiastical parishes of Melling and Tatham in Lonsdale. Whilst the latter coincides with the township of Tatham (the civil administrative unit – now civil parishes), the former consisted of seven townships: Melling with Wrayton, Arkholme with Cawood, Hornby, Farleton, Roeburndale, Wray with Botton, and Wennington. These eight adjacent townships also share a common element in their history, having been a core component of the historic Hornby Castle Estate. In its post-Saxon form, the estate originated in a grant of the manor of Hornby to the Montbegon family in c. 1086 by William the Conqueror. Ownership then followed a complex sequence of events involving descent, marriage, seizure and reassignment, resulting in changes in the size of the estate, with a notable one being the addition of Tatham manor in 1460 by marriage.1 In the 1580s, William Stanley 3rd Lord Monteagle had a detailed survey made of his estate, which showed it then to comprise lands in all of the above townships as well as other manors and lands in Lonsdale and elsewhere.2 However, over the subsequent centuries there have been substantial sales of individual properties, culminating in the final sale of the remnant in 1938. Changes in the population of such an area are a response to a set of inter-related economic and health factors which affect birth and death rates and inward and outward migration. Such factors include conflict, disease, famine, commodity prices and, from the late 1700s onwards, technological improvements in agriculture, industry and transport. The influence of these can be traced in the history of the population of Melling and Tatham, which can be reconstructed to varying degrees over the last nine centuries, using the decadal censuses from 1801-2001 and by modelling and estimation for the preceding centuries. Fig 1: Tatham & Melling parishes: population trends 1801-2001. 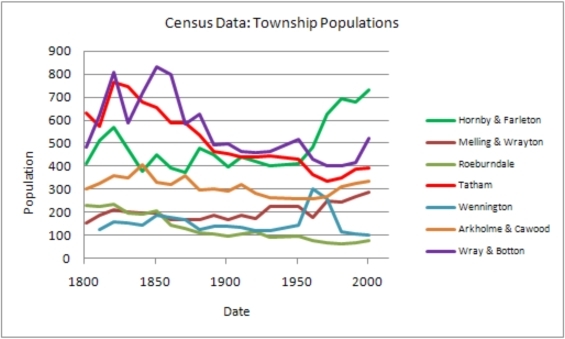 The census data show that the local townships have all experienced major changes in their population in the last 200 years. With two exceptions, after early nineteenth century peaks the numbers dropped to minima in the late twentieth century (1961-1981) before increasing again (fig. 1). The decline was greatest in Roeburndale (73 % change), but those of the more populous Tatham and Wray (56 % & 52 %) were numerically more significant. Consequently, the combined population of the two parishes followed this trend, declining by 40 % from 1821 to 1961 (fig. 3). This has been shown to be the pattern for the whole of the Lunesdale Census Registration District up to 1911, with loss in every decadal census.3 It was the only District in the north-west to display this behaviour, others, including Morecambe Bay, had overall growth and, in some cases, net migration gains. However, agricultural Districts in the north Pennines resembled Lunesdale. Nevertheless, there was considerable variation between townships. Thus, the early decline was as low as 21 % in Melling and, here and in Hornby, was limited to the first part of the nineteenth century, thereafter the population remained relatively stable until recent advances. This probably reflected investment by incoming industrialist and urban landlords (Fosters of Hornby & Bradford, Saunders of Wennington and Liverpool, Rome of Melling & Liverpool). In addition, there was the first local expression of the welfare society, with the Poor Law Union workhouse opening at Farleton in 1874. In contrast, Wray had particularly large population swings in the nineteenth century due to the changing fortunes of the silk mill, superimposed on the decline of their traditional industries of hat and nail manufacture and coal mining. The changing economies of the townships are described elsewhere (see Tatham History Society website). In the late 20th century, deliberate Government intervention in the local economy, through the financing of an expansion of jobs in tertiary education, health and power generation, led to population growth, with the car spreading the benefits over a wider area. However, the influence of local planning decisions is seen in the concentration of growth in Hornby. For the period for which births and deaths are recorded, population changes can be analysed using a simple procedure of ‘demographic accounting’. This model relates the change between two populations to the effects of events happening in the intervening period, i.e. births, deaths and net migration. Any one of these five can be calculated if the others are known, and it can be run forwards (forecasting) or backwards (hindcasting) (see appendix for details). The populations of Tatham and Melling are known from the censuses for every decade from 1801-1901. Before that there are two dates at which the population can be estimated: 1664 based on the number of households derived from the Hearth Tax Assessments and 1563 based on the Congregation List for the Lancashire part of the Deanery of Lonsdale, of which Melling and Tatham were a substantial portion. (Table 1).6,7 The Hearth Tax numbers are taken from copies of the originals but those for the congregation are calculated proportionally from the totals for Lonsdale using the relevant Hearth Tax value and that for the Deanery. Both are converted to populations using a standard estimate of the average household size of 4.75 persons (4.3 has also been suggested as being a better fit to the original Hearth Tax calibration data8). Interestingly, the household numbers implied by the survey of Hornby Castle Estate around 1580 indicate that it only represents about half the population of the area, on average.2 Whilst this may be partly due to under-representation of tenants, such as sub-tenants of freeholders (free tenants), it may indicate the reduced degree of ownership in the area by the Lord of the Manor. Using this information the demographic accounting procedure can be used to determine the reasons for the recorded changes in population, i.e. the net result of inwards and outwards migration of people and the net result of births and deaths, i.e. natural increase, as shown in Table 2 (see appendix for discussion of the uncertainties in these figures). For Melling, only population change figures can be given. 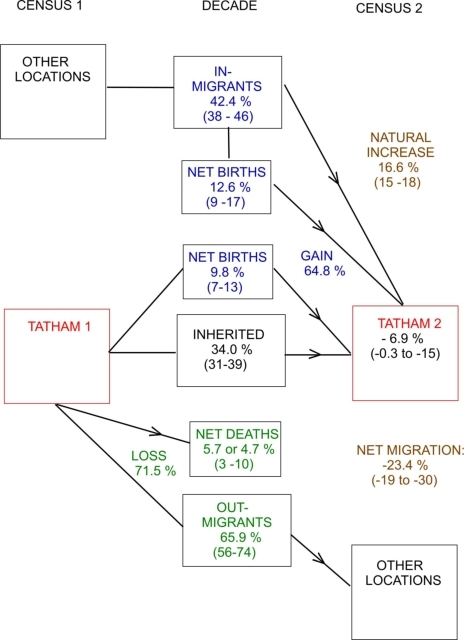 The results for Tatham show that, in the century from 1563 to 1664, there was a low population growth of 16 % overall due to natural increase (excess births over deaths), although about a third of that was lost to a small net out-migration. From 1661 to 1821, there was a very substantial natural increase, due to a nearly two-fold increase in the baptism rate more than offsetting an increased burial rate. This is seen elsewhere in England and is considered to be due to a fertility increase as a result of slightly earlier marriage.4 However, three quarters of this gain was lost by the four-fold increase in net out-migration. The final phase from 1821 saw the average decadal rate of natural increase grow by a further 50 %, due to the halving of the death rate whilst baptism rate remained essentially constant. However, a further nearly threefold increase in out-migration rate to 21 % led to the overall drop in population of 41 %. The trends of population changes in Melling are similar to those of Tatham, doubtless due to similar causes, although there was a larger increase in the middle period and a smaller subsequent decrease. The net out-migration for the last phase is substantially greater than the 8-13 % mean value given for the whole Lonsdale Registration District in 1851-1911 and falls into the highest category for all districts in England.3 It is also much larger than that calculated for 5 groups of rural parishes in 4 regions of England.13 Using a similar procedure to here, net out-migration there was found to vary from 7 to11 % in 1851-1861, less than or just exceeding the natural increase. Further detail can be obtained by using the demographic accounting model to hindcast the population change every decade, using the baptism and burial records and net migration values which give the best fit to other population data (see appendix for model details). These controls on the model are the census data and the 1664 and 1563 estimates (two for each date). Starting at the 1901 census population, with an average net out-migration of 21 %, the predicted population curve matches the census back to 1821, agreeing with the above gross analysis. For the preceding period back to 1664, out-migration appears to have been more variable, with higher rates of 10 % back to 1731 reducing to about 4 % to 1664 and about 1.5 % to 1563. The population drop in 1811 cannot be modelled on this basis but, as the early censuses were based on head counts and the drop is only seen at Tatham, it may not be real. Fig. 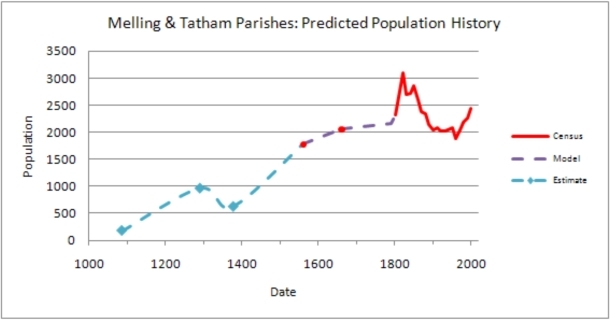 2: Tatham Parish: Hindcast population estimates 1563-1901, with baptisms and burials. Again, the deficiencies of the Melling parish records means that hindcast modelling cannot be carried out and the curve for the combined parishes (fig. 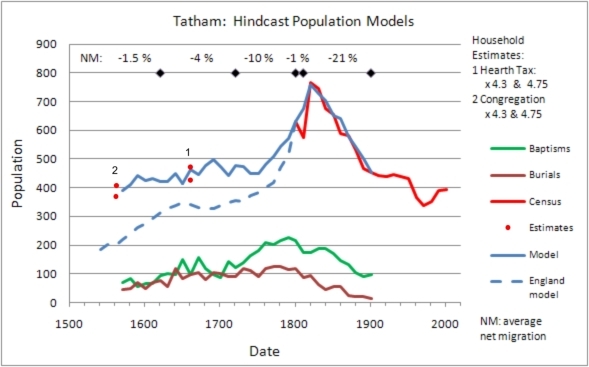 3) is an approximation scaled from the trends in the Tatham model, combined with the actual 1563 and 1664 population estimates. Fig. 3: Melling & Tatham parishes: Population estimates 1086-2001. The economic basis for population growth was the expansion and intensification of agriculture. This included reclaiming land from the ‘waste’ on all scales, including enclosure by Parliamentary Act, and changes in the nature of land holding and land occupation by owners and tenants. Later came the improvements in stock-breeding and farming practice of the eighteenth century and, finally, the technological advances of the following two centuries. The growth of agriculture led to the growth of related craft industries, such as blacksmiths and wood workers, then increasing in diversity as more specialists could be supported by the population and as local resources became utilised, e.g. basketry, clog making, quarrying, coal mining. Some of these developed in the 19th century into proto-industries with wider markets, e.g. bobbin making, silk processing, nail and hat making. Also by then a retail and service economy existed, based in the hamlets and villages of the area. Whilst it has been possible to describe gross population changes with various degrees of precision, this does not describe the changes occurring at an individual level, i.e. changes in population composition. For the period 1781-1901, it is possible to derive information about this from census and land tax records. Comparing the names of individuals present in adjacent censuses, and the numbers of baptisms and burials (births and deaths) in the intervening period, shows that the net out-migration figures given above are the result of large movements of people both into and out of Tatham. This can be investigated using an expanded version of the ‘demographic accounting’ model (see Appendix for details). The average results for 5 pairs of censuses from 1851-1901 are shown in fig. 4, with the range of values given in brackets. Notably, on average, only a third (34 %) of the next census population was inherited from the preceding one, with another 10 % contributed by the births from this group in the intervening decade. The main loss, numerically equal to 2/3 of the new population, was by out-migration. The resulting deficit was only partly made up by the in-migrants and the children born to them in that decade, giving a net population decrease. This pattern was repeated over the 60 years between 1841and 1901, giving an average figure for each 10 year period for population reduction of 6.8 %, being the difference between a net out-migration of 23.4 % and a natural increase of 16.6 %. The overall figures for the whole period are: population reduction 41 %, net out-migration 140 %, natural increase 100 %, i.e. percent of the 1841 population (slightly different to Table 2 values due to their different calculation basis). This fall in the population by well over a third, whilst largely due to out-migration is also partly due to the decline in the birth rate in this period, from 2.6 % to 1.8 %, as a result of such factors as the selective migrant loss of fertile women, later marriage and deliberate family limitation. Clearly, the exchange of people between Tatham and elsewhere in this period was considerable, with an average of 42 % newcomers in each decade. The additive effect of this is seen in the census records of birth places of Tatham residents for 1901: 84 % of male heads of households and 87% of wives were born outside Tatham. Analysis of the 1841-1851 decade provides some detail about these migrants. The majority of the in-migrants were families, 39 % of them headed by farmers and 20 % by other occupations including: agricultural labourers; railway & general labourer; carpenter & wheelwright; joiner; stone mason and three bobbin makers. Single adults or teenagers (41 %) were mainly farm and domestic servants, but included family members joining extant residents, e.g. wives, elderly parents etc. Birth places show that, as expected, in-migrants in 1851 came mainly from surrounding parishes up to 10 miles from Tatham church (59 %), together with 16 % from 10-30 miles and 9 % beyond that, with a further 16 % returning to Tatham. Out-migrants were also largely families (59 %) with half of these being headed by farmers and the other half made up of families of farmers' widows, agricultural labourers and tradesmen: bobbin turner; carpenter; miner; tailor and weaver. Individual adults (27 %), male and female, were split between servants and others. The age distribution of out-migrants was markedly skewed to the 10-29 years range, who were obviously leaving for employment or marriage (fig. 5). Fig. 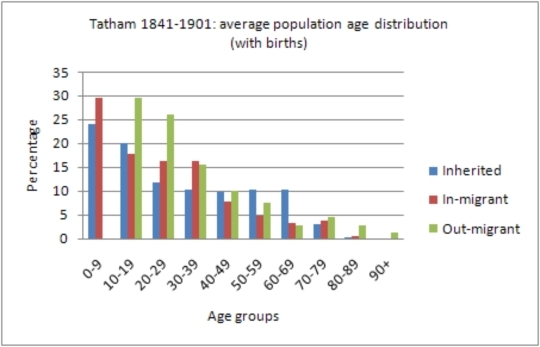 5: Tatham Parish: Age structure of population components (including births) 1841-1901. However, it is clear from the annual land tax records for 1781-1823 that the decadal census snapshots are hiding even more frequent changes in land tenancies. The above census data give an apparent average farm tenancy as 20.5 y, whereas the land tax records give 11.5 y, both including a small proportion of family inheritances. It is probable therefore that similarly short tenancy durations existed in the farming community in the decades up to 1901. 1 British History online 2011: Hornby. www.british-history.ac.uk. 2 Chipindell, W.H. 1939: A sixteenth century survey of the Estates of Hornby Castle Lancashire. 102, Chetham Society, Manchester, 150 pp. 3Lawton, R. 1968: Population change in England and Wales in the later nineteenth century: an analysis of trends by Registration District. Inst. Br. Geog. Trans., 44, 55-74. 4 Anderson, M. (ed.) 1996: British population history from the Black Death to the present day. CUP, Cambridge, 421 pp. 5 Short, B. 2000: Rural demography 1850-1914. In Collins, EJT (ed) The Agrarian History of England & Wales. CUP, Cambridge, Ch 21, 1232-1296. 7 Phillips, C. B. & Smith, J. H. 1994: Lancashire and Cheshire from AD 1540. Longman, London & New York, 416 pp. 8 Arkell, T. 1982: Multiplying factors for estimating population totals from the Hearth Tax. Local Population Studies, 28, 51=57. 9 Lancashire Parish Register Society: Tatham 1558-1812 CD 59 & Tatham Fells 1745-1837, Tatham St James the Less 1813-1837. 10 Lancashire Record Office: Bishop’s Transcript of Tatham & Tatham Fells Baptisms 1838-1851. 11 Lancashire Record Office: Tatham Parish Register of Burials 1838-1901. 12 Anguline Research Archives: Melling Parish Registers Baptisms 1625-1721, Burials 1629-1721. 13 Hinde. A. 2004: The use of nineteenth century census data to investigate migration. Local Population Studies, 73, 8-28. 14 Wrigley, E. A. & Schofield, R. S. 1981: The population history of England, 1541-1871. Harvard Univ. Press, Cambridge, Mass., 797 pp. 15 Broadberry, S. N. 2010: English Medieval population: reconciling time series and cross sectional evidence. 17 Holt, J. 1795: General view of the agriculture of the County of Lancashire with observations on the means of its improvement. Board of Agriculture, London, 241 pp. 18 Mills, D. R. & Schürer, K. 1996: Migration and population turnover. pp. 218-228. In: Mills, D. R. & Schürer, K . (eds) Local communities in Victorian census enumerators books. Local Population Studies Supplement. Oxford. 19 Wojciechowska, B. 1996: Brenchely: a study in a mid 19th century parish. In: Mills, D. R. & Schürer, K . (eds) Local communities in Victorian census enumerators books. Local Population Studies Supplement. Oxford. where Q is the population values at times 1 & 2, and the events are births (B), deaths (D) and net migration (MN), the latter being either positive (gain) or negative (loss). The above version is for forecasting, the signs of the life events being reversed for hindcasting. Baptism and burial records of residents from the parish register are used here as proxies for births and deaths up to 1851 but, from then to 1901, the net births recorded by ages in the census data have to be used, i.e. they exclude births which resulted in deaths in the intervening years.6,7,8 Burials from the parish register for that period are corrected to the same basis. Delays between life and church events are not taken into account and it is assumed for the sake of simplicity that the population dates are the same in each year. Any errors associated with the records of baptisms and deaths, such as under recording, which led to a change in the birth to death ratio would affect the calculated migration value. From an investigation of parish records for a reconstruction of the population of England, Wrigley and Schofield considered that both births and deaths were underestimated, with births more so than deaths, giving a correction factor for birth to death ratio which rose from 2 – 4 % from 1661 to1836.9 (Note: percentage rates / decade = rate / 1000 / y, i.e. the unit used in reference 9). These have not been applied here, which implies that the calculated net out-migration values are under-estimates if the correction factors are correct. where Q1 and Q2 are populations separated by a decade, B1, D1 and M1 are the net births, net deaths and out-migration that affect Q1 during the decade, and MG is the in-migrants and BG their net births during the interval. The births and deaths are net events with respect to the census, as described above. There are inherent uncertainties in this modelling associated with incomplete baptism and burial data and the household size factor. The values obtained by the modelling should be considered as approximations.